PLEASE INQUIRE ABOUT PRELIMINARY TIMES OF DELIVERY. Omnidirectional antenna (3/4 Lambda Coax J antenna) for GSM 900. 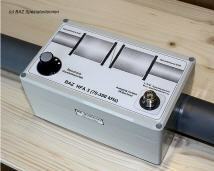 Frequency 870-950 MHz, G 4,2 dBi, Pmax 100 W, link N-socket, level of 36 cm, inclusive. Mounting material, side mast mounting 25-54 mm.